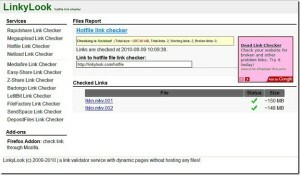 Found Rapidshare or Hotfile links to the file you’re searching? Before you go through the long and tedious process of copy-pasting the links in a new tab to download your file, check their authenticity. You never know which link might turn out to be dead or invalid. Ofcourse there are many link checkers online which again require you to paste the links into the link checker box. Why waste time when Firefox already has an addon for this? Try out Linkylook for Firefox. 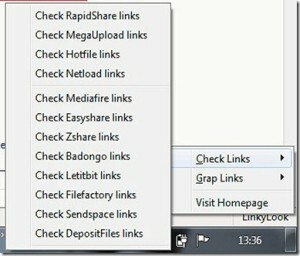 Linkylook provides you the convenience by checking all the Rapidshare or any hosting site links on any website. 1. Once you install the addon restart Firefox. 2. Go to the webpage where you have the Rapidshare links. 3. Right click on Linkylook (bottom-right in firefox) and select the category of links you want to check. 4. You will be redirected to the homepage where you can see whether the links are dead or still active. As of now the services that are available are: Rapidshare, Megaupload, Hotfile, Netload, Mediafire, Easyshare, Zshare, Badongo, Letitbit, Filefactory, Sendspace and Depositfiles – which mostly covers all the popular filesharing websites. So go ahead and download Linkylook – No more dead links for you.